What do you charge for Medeco key cutting / originating? The subject says it all! What do you guys and gals charge to duplicate or originate a key for a Medeco lock? If you wouldn't mind, also comment your location. Thanks! Re: What do you charge for Medeco key cutting / originating? I dont charge but the usual cost to copy a medeco key in New York is $10-25 dollars. In the Manhattan its $20-25 and in the surrounding areas its $10-20. 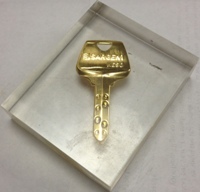 biaxial/M3 keys with card are somewhere around 20, usually have to be ordered.